fuses and integrated heat sinks for a better compactness of the units. 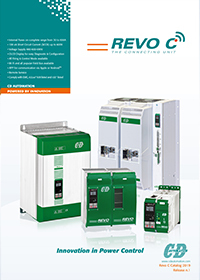 The real strength of REVO C, however, is the ability to configure the unit and monitor it not only via fieldbus, but also through your smartphone or tablet thanks to the integrated WI-FI. In addition, the App Remote service for Ios and Android will allow you to monitor the unit and process variables in real time, but above all, to get a prompt assistance remotely worldwide from our engineers in case of need . The REVO C series of thyristor units is equipped with the new UL 508 certification, which not only reduces the associated costs of plant certification, but also shortens the time required to complete the project. Certification is available on units from 30 up to 700A, in versions 1-2-3PH and with maximum voltages of 480V and 600V.